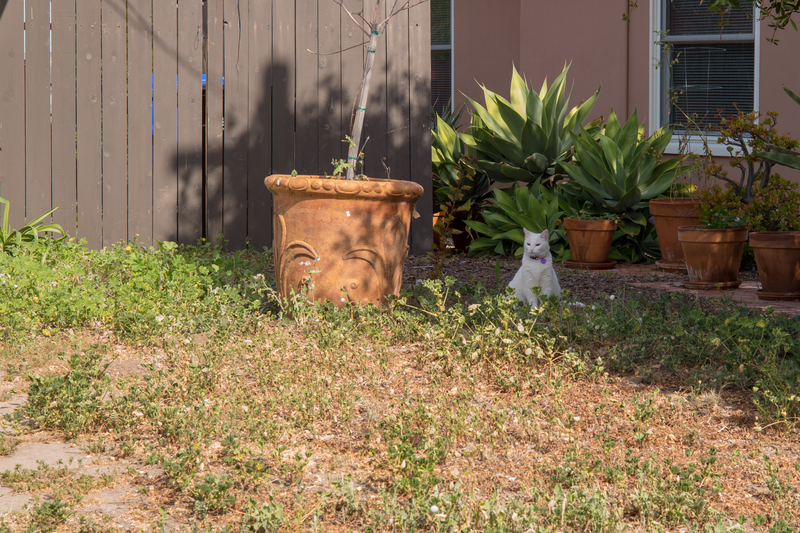 What a lucky Friday the 13th find is this adorable white, which my wife spotted six days ago as we walked by Carmelita where it meets Mission Cliff. 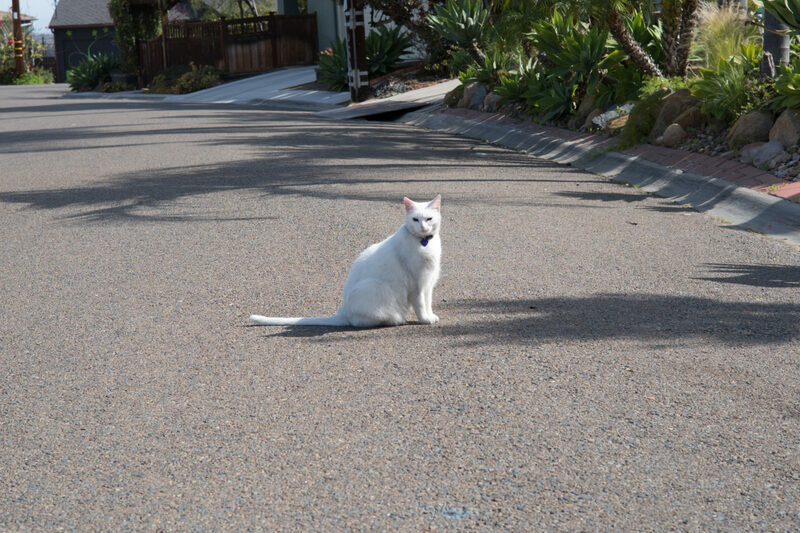 Aylin, or so her tag says, stood quietly in the grass of one house before coming out into the street to greet us. I captured the Featured Image and companion using Leica M10 and Summarit-M 1:2.4/50 lens. Vitals for the first: f/8, ISO 100, 1/60 sec, 50mm; 9:30 a.m. PDT. The other, taken four minutes later, is same except for 1/125 sec shutter speed. The property where we first saw Aylin wasn’t her home. A loud vehicle scared her from the street, and she ran across the way to another lawn and into an open door. Update, May 5, 2018: While walking, Anne and I saw Aylin, who scurried from her porch to the sidewalk for attention. Her owner came out, and we had the most delightful conversation. Ages ago, there was an air force base in Limestone, Maine, and her then-husband was among the stationed personnel. For part of the time, at least, they lived in neighboring Caribou (e.g. my home town). Oh, regarding the main photo: Gophers live under the neighor’s yard, and Aylin waits by their holes for one of them to come out. Yep. She is the local pest control. Hey, pretty kitty: Scruffy, Roly Poly, Woo, Skull, Biscuit, The Colonel, White, Chipper, Frisky, Stretch, Needy, Farfisa, Mates, Hunter, Pee-Pee, Blue, Blue Too, Bonded Pair, Patience, Fess, Jumper, Frenemy, Looker, Cozy, Scout, Lurks, Skit, Mini, Betty, Black and White, Stalker, Bell, Chill, Sammy, Scratch, Poser, Star, Grey and White, Watcher, Herman, Comet, Roman, Willow, Chub, Nimbus, Watson, Lilo, Kit, Pepe, Twilight, Sebastian, Spot, Booger, Ash, Veruca, Riley, Mellow, Bonde, Flower, Glass, Black, BeBe, Fang, Bruce, Siamese, Pounce, Tortie, Haiku, Fraidy, Peso, Daniel Tiger, Dusk, Stride, Dainty, Spry,Tabby, Betty Too, Still, Levi, Shadow, Sophie, Wink, Ferals, Momma, Charlie, Tux, Cool, Benny, Jellicle, Itchy Valentino, Goldie, Nine, Amanda, Siesta, ChaCho, Charlie, Too, Mika, Crystal, Seeker, Mittens, Dancer, Smokey, Monkey, Captain Blackbeard, Season, Maven, Tink, Chunk, Curious, Hanoi, Bella, Tarry, Guido, Maxine, Mr. Kitty, Peohe, Panda, Frankie, Sunshine, Twain, Willow, Too, Brawn, Reddy, Burglar, Laramie, Lupe, Bright, Tom, Charm, Buddies, Boss, Ohana, Seer, Fresh, Token, Lola, Carl, Bramble, Finny, Cal, Tipsy, Zander, Mew, Penny, Charlie (the Third), Bob, Apple, Persepolis, Sebastian, Too, Holiday, Snow, Desire, Luci, Torbie, E.T., Bushy, Cali, Precious, Gracie, STAR, Sky, and Amble.